There are a lot of stray cats struggling to get by in the town I live in, and I recently found a post by a local family who are doing their best to support their friendly neighborhood stray, Teddy. Teddy is a sweet little girl who has developed skin cancer and needs to have her ears amputated. This kind family has decided to take her in and take care of her surgery which will cost upwards of $2000. They’ve started up a fund for Teddy and are grateful for any help. We met Teddy almost 5 years ago. She was a lively neighborhood cat, always friendly and rubbing against you as you were walking by. 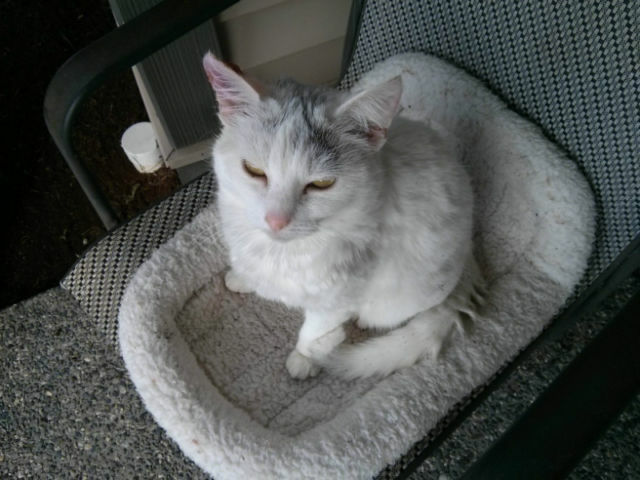 She was living in a house but didn’t seem to get along with the other indoors cats so she preferred to stay outdoors where she could have peace and quiet time for herself. Very independent and yet very loving with humans she was a leader in her area. All the other cats were following her as she was projecting a certain confidence. But last year, for some reason, she started to lose weight. We did not worry much as we knew she had owners. Then, as winter started to set in, she was hanging more and more by our house to finally ask to come in as she was obviously cold. Since last winter, we noticed Teddy was losing energy and was also increasingly scratching her ears. Her ears were so red and itchy that one started to bleed and get infected. A visit at the veterinarian informed us that Teddy had skin cancer and that both her ears had to be surgically removed. Unfortunately the price was excessively high for our budget. We already have a family and two cats. But we sincerely love that shy yet loving cat. We are ready to give her a home but we would need your help to finance her surgery. It’s the only way to stop the cancer progression and save Teddy’s life. We thank you in advance for your generosity. Your donation will definitely make a difference. This entry was posted in cats and tagged save teddy, stray cat. Bookmark the permalink.